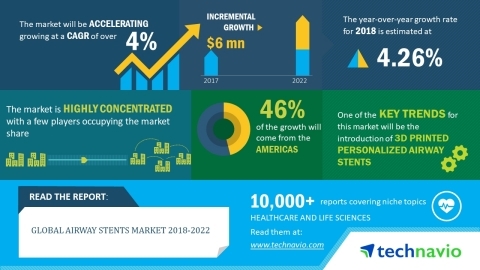 According to the market research report released by Technavio, the global airway stents market is expected to accelerate at a CAGR of more than 4% during the forecast period. The growing prevalence of cancer and respiratory disorders is one of the key factors triggering the growth of the market. This research report titled 'Global Airway Stents Market 2018-2022' provides an in-depth analysis of the market in terms of revenue and emerging market trends. It also includes an up-to-date analysis and forecasts for various market segments and all geographical regions. In 2017, the self-expanding airway stents segment accounted for 70% of the global market and is projected to reach 69% by 2022, exhibiting almost 1% decrease in market share. The introduction of 3D printed personalized airway stents is an emerging trend in this market space. Over the last two decades, 3D printing has undergone a series of revolution in the medical imaging industry. Due to the ever-changing demand for airway stents, clinicians and researchers are focused on incorporating 3D printing technology into airway stents. The researchers are also focusing on introducing 3D printing in tissue engineering, procedural planning, and personalized manufacturing of airway stents. Rapid prototyping and additive manufacturing techniques in healthcare have already yielded some exciting results and point to a bright future involving these technologies. In the medical industry, 3D printing is majorly used in pulmonology.